National Trail’s Peyton Lane pins Dylan Hollar of Triad in a second round match during the Division III sectional at Lehman Catholic High School on Friday, Feb. 23. Lane won the 132-pound division and improved his record to 28-1. Preble Shawnee’s Bryce Abner pins Joey Kendrick of Middletown Madison in a quarterfinal match of the Lehman Division III sectional wrestling tournament on Friday, Feb. 23. 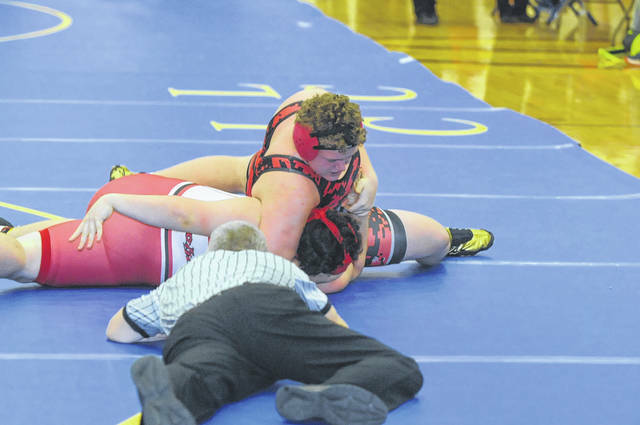 SIDNEY — Despite having a 24-1 record entering the Division III sectional wrestling tournament, National Trail’s Peyton Lane was tabbed as the No. 2 seed. The top seed went to Preston Platfoot of Versailles, who was 38-14 entering the tournament. Platfoot was awarded the top seed based on his placing at the district meet last season. Lane was injured last season and did not compete, according to Trail coach Bobby Clark. 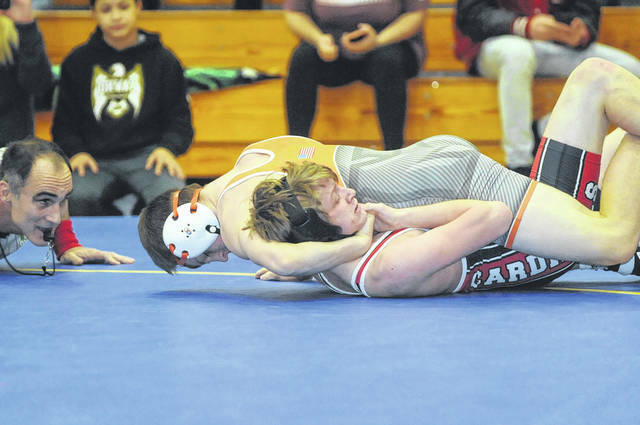 But when the two met in the final of the 132 pound division on Saturday, Feb. 24 at Lehman Catholic High School, it was Lane who came away as the sectional champion with a 4-0 win over Platfoot. With his four wins, Lane improved to 28-1 and will be a top-seed at this weekend’s district tournament at Troy’s Hobart Arena. Lane won his first match by pin over C.J. Worley of Carlisle in 41 seconds. He won his second match with a pin in 50 seconds over Dylar Hollar. In the semifinal, Lane defeated Clint Brown of Legacy Christian, 3-1. He will be joined by six wrestlers from Preble Shawnee, three of which earned runner-up spots. Travis Howard reached the final at 138 pounds, with wins over Aiden Bentley of Carlisle and Kyle Wuebker of Northeastern. He lost to top-seed Drew Price of Madison, 8-3, in the final. Ty Stevenson collected wins over Austin Nerderman of Versailles and Collin Haller of Lehman Catholic to reach the 220 pound final, where he lost to Cole Mefford of Indian Lake, 9-3. Freshman Bryce Abner, who was unseeded, reached the final with wins over Joey Kendrick of Madison and top-seeded Jeffrey Ware of Versailles, who he pinned in 2:45. Abner fell in the final to Jayden Helsley of Arcanum by pin in 1:27. Rylan Roberts took third at 120 pounds. Triston Engle was fourth at 145 and Kanyon Schall was fourth at 160. The district tournament will be held Friday and Saturday, March 2-3 at Troy’s Hobart Arena.